Sweat beaded on Abraham’s forehead as he lay prostrate on the unswept rug covering the ground in his tent. He whispered thanks that God had led him to Beersheba and helped him peacefully negotiate a treaty with King Abimelech. Various noises of family, servants, and animals swirled around outside. He wasn’t listening for a particular sound that could be found out there. He waited for the one voice he yearned to hear again. Abraham knew he couldn’t negotiate with the Lord. He had walked with God long enough to know that obedience was his only choice. He heard Isaac’s vibrant laugh just outside the tent. “Laughter?” His wife, Sarah, had chuckled when he told her what God had instructed him to name their son. The shining visitors who came to see them many years before told how Sarah would have a child, even in her advanced age. She had laughed at their words, but they had been right. As the sun set in the distance, the camp settled into sleep. Abraham laid beside his wife with his eyes wide open. Her chest rhythmically rose and fell with her steady breathing. Isaac slept nearby. The moonlight washed his young face, accentuating his cheeks thinning into manhood and the scruff of a newly grown beard. No wrinkles etched his face or held the sands of the desert, but small lines were just beginning to form at the corners of his eyes. It was no surprise for a person that had been laughing since his birth. Silent, Abraham rose and walked to the nearby well he had dug with his own hands. Lowering a bucket, he collected some fresh water. Before taking a drink, he leaned down to look into the still water. The same moonlight that had lit his son’s face lit the waters. His reflection showed every line and wrinkle on his own leathery face. One hundred and thirty years had come and gone, leaving their mark on him. It was impossible for his wife to bear another child. How could he father another child if Isaac was gone? The last time they tried to intervene in the Lord’s plan, it hadn’t worked. Somewhere across the desert, another boy was growing into adulthood. He was the result of Abraham and Sarah’s attempt to help the Lord in His plan for them to produce a child in their old age. Sarah had given her servant, Hagar, to Abraham and she had borne a son to him. The plan had disrupted their peaceful life and had given rise to the anger of the Lord. Abraham had no choice but to send them away, even though his heart broke to do so. It was all he knew to restore the harmony in his camp. He often thought about Ishmael. Had they made it to a safe place? Were they alive and well? He placed his hand in the cool water and took a small sip. Then he dipped both hands into the bucket and splashed some onto his face. The water cleared his mind for a little while until Isaac’s face returned and the memory of his son’s infectious laughter tore at his heart. He made pass after pass around the well until his footsteps formed a slight path in the sand. Then he made his way back to his tent and laid down beside his wife again. She rolled over to snuggle closer to him. Sleep continued to elude him. Images of his son’s burning flesh interrupted his dreams several times. Well before sunrise, he decided to give up and begin the day. He sat outside of the tent sharpening his favorite knife. If he had to do this thing required of him, he would at least make it as painless as possible for his son. “And?” Isaac asked, excitement ringing through his voice. Abraham dared a quick glance at his son’s back. His heart wrenched and he had to return his attention to the tools in his hands. He ran his thumb against the blade feeling the honed edge. Satisfied the knife could not be sharpened any further, he returned to his tent to pray again. Three days of journeying north through the desert passed too quickly for Abraham. His son spent much of the time talking which had been a welcome distraction from the task ahead. Before long, he caught sight of the mountains in the distance and gave the sign to stop. “Are we there?” Isaac asked. The two men nodded in agreement. When they reached the top, Abraham drove the end of the torch into the ground. He and Issac gathered large stones to form an altar. With enough boulders to construct a flat surface, Abraham took the wood from Isaac and carefully arranged the pieces on the stones. He looked at the empty altar and tried to slow his pounding heart. The next step was the hardest. How would Isaac respond? The young man had great strength and speed over him. Even if Abraham could somehow manage to overpower and bind him, there was no way to lift him up onto the altar alone. Abraham reached into his sack and removed a piece of rope. He took a step closer to his son. Isaac looked around and back at his father. “I-I-I don’t understand.” Isaac shook his head. He glanced down at the pile of sticks. “I need you to lay down,” he pleaded. Isaac searched his father’s face. “Yes, Abba.” With much ease, the young man lifted himself onto the altar and laid down. Abraham bound his son’s arms with the rope. After he made sure it was secure, he put his hand on the hilt of the knife. “Abba?” Isaac’s voice broke with a hint of a whimper. Abraham kept his eyes on his son’s bound hands. He feared if he allowed his gaze to meet Isaac’s eyes, he wouldn’t go through with the offering. With a jerk, he pulled the knife from his belt as tears flooded his vision. He raised the knife over his head and shut his eyes. He tightened the grip on the knife. His bicep flexed. “I love you, my son,” he whispered. A force pulled at Abraham’s wrist to the point he could not move. He looked up to see a hand gripping his arm. He followed the hand down to meet the bright face of a being. One not unfamiliar to him. He wasn’t one of the ones who met with him in his tent the day God told him his wife would bear his child, but he was one like them. “Abraham! Abraham!” a voice thundered above them. Abraham covered his face and wept. He looked through blurred vision at his son still on the altar. “Yes, my son.” He rose in haste, tripping over his old legs and scrambling to reach the top of the altar. With swift fingers, he untied Issac and hugged him. A rustling nearby caught his attention. He turned to see something moving in the bush. He walked closer, daring to hope. Caught in the thorns, a large ram struggled to free itself. Being gentle, he freed the animal and brought it back to where Isaac stood beside the altar. Abraham took the rope and bound the animal. Together they placed the ram on top of the wood. Isaac bent down and picked up the knife. He held it out. Abraham looked at his son’s face for the first time since they had come up the mountain. His hearted thudded with love and pride. He nodded and took the knife. 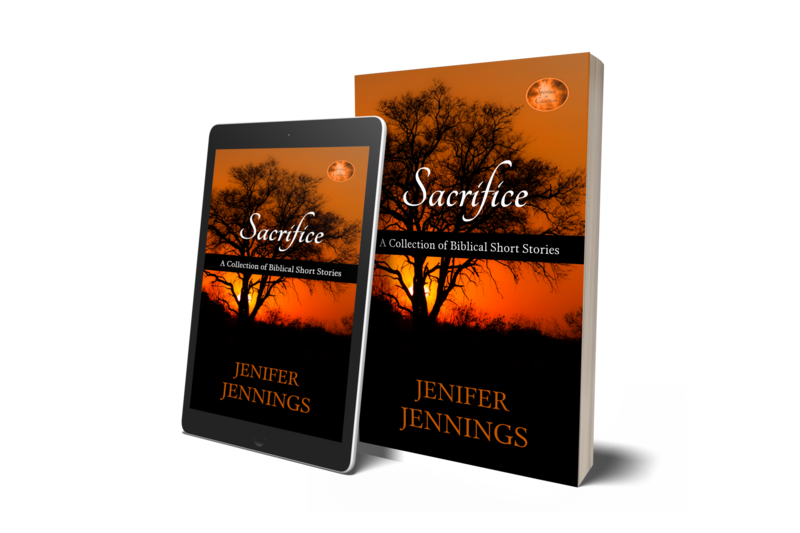 With skilled hands, he slit the ram’s throat and then picked up the torch to ignite the wood. Abraham led his son back down the mountain toward their waiting servants. “Let’s go home,” he said, putting his arm around Isaac’s shoulder. 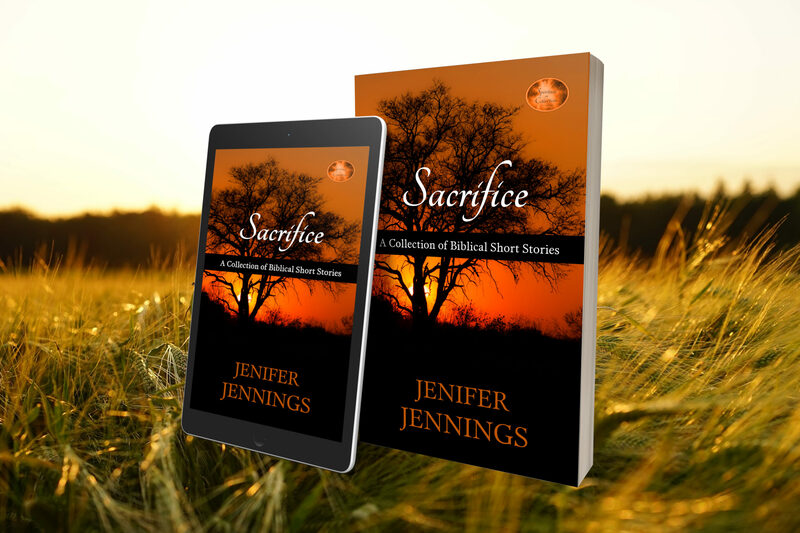 ​Grab your copy of Sacrifice for $1.99 eBook or $​4.99 paperback. See what God can do with our sacrifice.